This EPA Updating Service by Email Saves You Time and Work! It's not easy keeping up on final environmental regulations, proposed regs, and notices. And when you need to track both federal EPA and state regs - you truly have a nightmare. Introducing RegUpdate.BLR.com - a dream come true. This twice-weekly email notification service from BLR's environmental compliance experts keeps you updated on all state and federal regulatory activity. 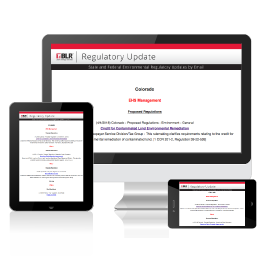 You get regulatory updates on all final and proposed regulations as well as notices. Pricing for RegUpdate.BLR.com - Environmental Regulation Notification Service is for internal organizational use only for one user and one state plus access to federal information. For custom pricing, additional users/states or to discuss external or third party use, please contact customer service at 800-727-5257. GUARANTEE: Your 100% satisfaction is guaranteed. If for any reason you are not completely satisfied RegUpdate.BLR.com, simply let us know within 90 days, and we will issue you a complete refund.